Bread can be toasted, buttered, fried, made into so many things…. sandwiches, breadcrumbs, croutons etc. 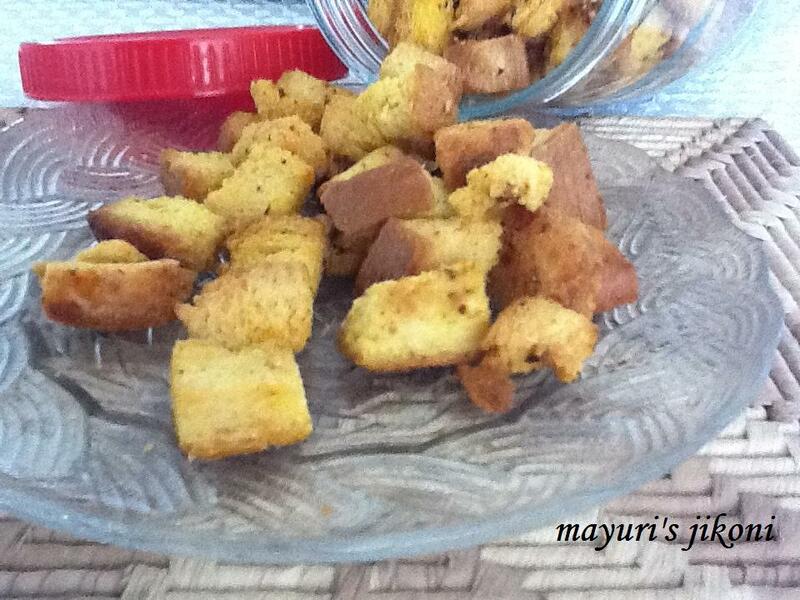 When Arti and Nimesh visited us the first time in Mombasa, she made vaghareli bread for us as a snack. Since then I use to make it regularly to put in the snack boxes of my 3 kids. Instead of making a fresh batch every now and then, I improvised on the recipe and made them crunchy so it could be stored in a jar for a few days. Use white or brown bread. I don’t cut th crust as it becomes nice and crunchy too. Thank you Arti. When did you make it the last time? An idea for brunch this weekend! I didn’t use cumin seeds as eventually they get left at the bottom of the pan or jar. I added cumin powder after the bread got toasted so that the flavour remains for longer and no wastage of cumin seeds. Cut the slices of bread into small squares. Heat oil in a frying pan or a wok over medium heat. When it is slightly hot, add the ginger and chilli paste and saute for a few seconds. Add the chilli and turmeric powder and immediately add the cubes of bread. Spread out the bread cubes onto a baking tray. Let it bake in the oven for 20 to 25 minutes or till the bread cubes become crunchy. Add the cumin powder and mix well. Let it cool a bit and serve or store in an airtight jar. Instead of putting indian spices, use olive oil, add 2 to 3 tbsps of any dried herbs like oregano, mixed, rosemary etc. Add sea salt and toast. When its crunchy add a bit of chilli flakes. Roast a handful of cumin seeds with a tsp of oil over low heat till they begin to pop. Let it cool down and then grind it into a powder in a coffee grinder. Store in an airtight jar. Use on salads, yogurt, chaas etc.